An attorney for Samsung argued Australian judge Annabelle Bennett was wrong in granting Apple a temporary injunction against the Galaxy Tab, saying the justice made a series of errors and failed to understand key elements of the case. Samsung's attorney Neil Young stated at an appeal hearing that "there was either no arguable case for infringement or it was very weak," according to a report by Dow Jones. Apple claims that Samsung's Galaxy Tab 10.1 infringed upon 13 of the company's patents, claims that will be examined in full at a later date. However, the judge overseeing the case preliminarily agreed, on the basis of just two of the patents, that Apple's case was strong enough to warrant a temporary sales ban until the full case was decided. She did not make a final ruling of infringement regarding any of the patent claims. A final hearing has not yet been set, but the temporary injunction has blocked sales during the critical holiday sales season in Australia. Apple is also suing Samsung in California and in cases in a variety of other jurisdictions globally, with a separate injunction on sales being won in Germany. It was in the US court that a judge held Samsung's Galaxy Tab and Apple's iPad in the air and challenged Samsung's attorneys to identify which one was made by Samsung, something the US attorney said she could not do from a ten foot distance. Samsung's lawyer argued that justice Bennett did not imply in her findings that Apple's claims were strong enough to justify the injunction, but Apple's attorney Stephen Burley said his company's infringement case had a "sufficient likelihood of success," justifying the imposition of the ban. Burley described the judge as having reviewed the infringement case in a detailed fashion, reportedly stating in court that "it was not a case of your honor ticking boxes" in arriving at the conclusion that sales of Samsung's tablet product be banned. 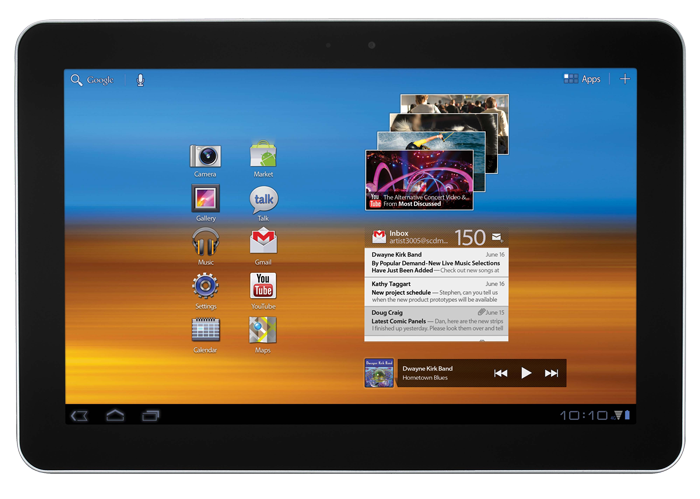 Even before the injunctions went into effect, consumers have largely ignored the Galaxy Tab 10.1 and other new 2011 tablet models running this spring's Android 3.0 Honeycomb software. One recent report by NPD noted that among all tablets sold in the US outside of the iPad, the best selling model was HP's now discontinued webOS-based TouchPad, which shipped fewer than a quarter million units. This winter, Amazon's Kindle Fire is expected to rank as the most popular tablet outside of the iPad, but it runs a year old version of Android incompatible with tablet apps targeting Android 3.0 or the latest 4.0 "Ice Cream Sandwich," an issue Apple claims will only further fragment the overall Android platform.